Teamup supports various types of notifications. Email notifications can keep you or your team members updated on changes and additions to your calendar. When someone no longer needs to receive notifications, they can unsubscribe or the calendar administrator can delete their notification subscription. As an individual calendar user, you’ll want to unsubscribe from email notifications if you are no longer involved in the organization, company, or group that owns the calendar. Or you may want to switch to a different kind of notification and no longer receive the email notifications. For organizations and calendar administrators, it’s important to ensure that calendar data stays secure; if an employee leaves the company, or if a client relationship ends, you’ll want to make sure that these individuals are unsubscribed to any calendar notifications. Every notification email contains a calendar link; if an unauthorized individual continues receiving notification email, they can still access the calendar by using the calendar link contained in the notification email. There are two ways to unsubscribe to email notifications. If you are subscribed to email notifications, click the link “Manage your notifications” in the bottom of a notification email you have received. Follow the link in the notification email to unsubscribe. If you are the calendar administrator and need to unsubscribe a user from email notifications, open the calendar with the administrator link. Go to Settings > Notifications, then click the Edit icon. Go to Settings then Notifications to see a list of all subscriptions. The notification email will always include the calendar link assigned to the notification subscription; this enables you to click through to the calendar from a notification email, which is often convenient and helpful. To maintain security, do not use an administrator link to subscribe to email notifications for non-admin users. Instead, create a customized calendar link for each user which appropriate permissions. 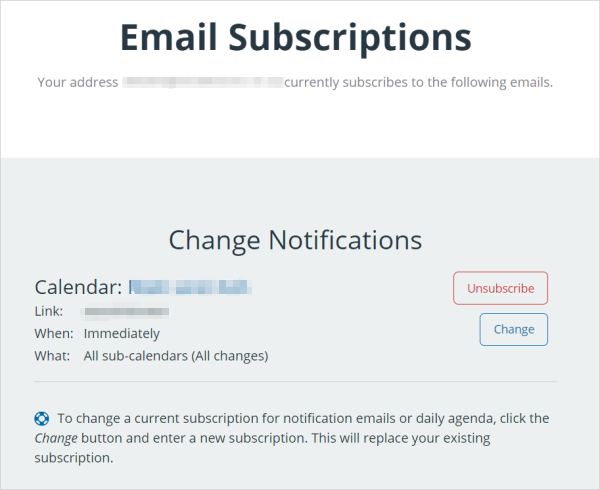 Then, allow each user to subscribe to email notifications from their own customized calendar link. This helps maintain calendar security and makes it easier to manage notification subscriptions as needed.